New Sonos Amp is available to pre-order now for £599 | What Hi-Fi? 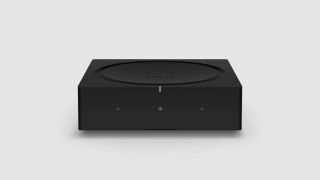 Having waited patiently while the US has enjoyed a couple of months of Sonos Amp availability, European Sonos fans are finally able to get in on the act, with pre-orders open right now. It costs a £100 more than the Connect:Amp, then, but that seems a fairly small price to pay for what is clearly a serious step-up in audio ability and features. For starters, the new Amp has more than double the power of the Connect:Amp, with 125W per channel on tap to drive far more substantial and demanding speakers. A stereo analogue input allows you to connect another audio source, such as a turntable, while the addition of an HDMI connection with ARC support gives the Amp Beam-like TV features. It will sense when the TV is on, for example, and automatically switch to playing that audio. HDMI-CEC means the whole thing is controllable via your TV's original remote, too. Two Amps can be combined to create a 4.0 (or, with the addition of a wired subwoofer or wireless Sonos Sub, 4.1) system with a phantom centre channel. Or you can use two Sonos Ones, Play:1s, Play:3s or Play:5s as surrounds, just as you can with a Playbar, Playbase or Beam. Of course, the Amp also does all of the multi-zone music streaming that Sonos is known for, giving you access to practically all of the world's music via the app or, increasingly, your voice (although the Amp doesn't have its own microphone so you'll need an Alexa or iOS device in order to issue voice commands). We have just had a brief listen to the new Amp and are broadly very impressed by it. Our first impressions will be on the site soon, with a full review to follow - so watch this space.